New land record will be set up by Bloodhound SSC. Building the fastest car for the consumer market will be far different than building the fastest car for fastest car on land for science and mathematical research. Hence for the reasons Bloodhound SSC is built to achieve a new land record that will exceed 1,000 mph (1,609 km/h). It seems lot easier when the car was completely built – it has been through a very long process with many different stages. This supersonic speed car has a tip of its nose as sharp as a pencil. With a rocket engine that will provide 33% of its main speed. Until today this car has reach its final stage for the first test drive at the speed of 200 mph (320 km/h) by this year of 2015. The next test site will be at Hakskeen Pan, Mier at the North Cape, South Africa where the track of 12 miles (19 km) length and 2 miles (3.2 km) wide had been prepared. The project was first announced on October 23rd, 2008 at Science Museum in London by Lord Drayson – who is the Minister of Science from Deparment of Innovation, Universities and Skills where the project ealrier proposed to Richard Noble and Andy Grees – the two men who hold the land speed record since 1983. Bloodhound SSC project is slightly different and to allow the greater speed limit changes can be achieved compared to the previous models of Thrust2 (speed 633 mph – 1,019 km/h in year 1983) and ThrustSSC (speed 763 mph – 1,228 km/h in year 1997) which also the first car to reach the speed of sound. 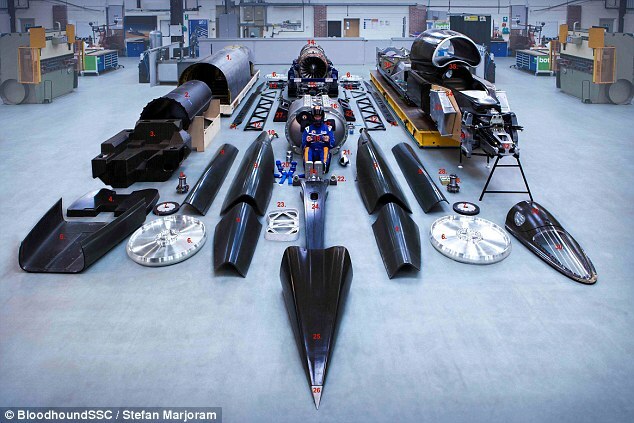 The whole components for Bloodhound SSC. In order to drive the Bloodhound SSC the driver Andy Green will need to be aware of the force challenge where the acceleration will produce 2.5g that will accumulate his blood into his head, meanwhile to slowdown the car the force of 3g will again rush into his feet that can cause blackout. So, the preparations are important for both the car and the driver and Andy needs to go through a stunt aircraft practice in order to familiarize with the intense g-force by flying upside-down. The construction of Bloodhound SSC involved many other people to ensure that the car can produce the right amount of force to achieve the target speed. 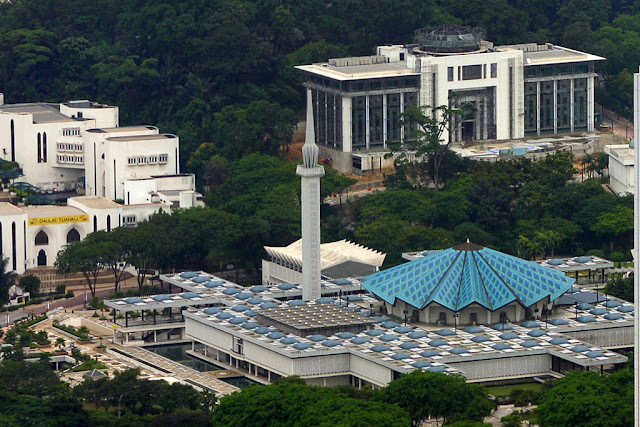 The aerodynamics shape was constructed at College of Engineering at Swansea University. The important people under the shape designs are Professor Oubay Hassan, Professor Ken Morgan and their team that used ‘Computational Fluid Dynamic’ (CFD) to understand the aerodynamic characteristics of proposed Bloodhound SSC body. Meanwhile Swansea University's School of the Environment and Society is helping to identify the suitable location for the testing site. The jet engine to be used by Bloodhound SSC is the prototype Eurojet EJ200 that was donated for this project. The engine was modified by Nammo to allow the engine to provide the speed that reaches 1,000 mph (1.609 km/h). One more engine to be used together is Jaguar supercharge v-8, that will act as an auxiliary power unit to drive the oxidizer pump for the rocket. The whole engine will provide 135,000 horsepower. The wheels of this car will be 36 inch (910 mm) that will rotate at up to 10,200 rpm and need to be forged from solid aluminum to resist the 50,000 g centrifugal forces. 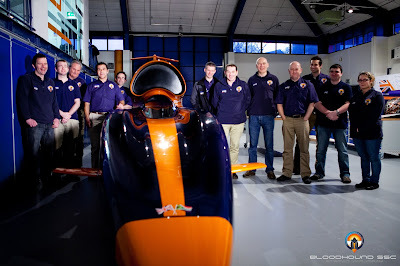 The engineers involved in the Bloodhound SSC. The main chassis was built using ‘carbon fibre monocoque’ the same concept as the Formula 1 racecar to ensure the safety of the driver. It also consists of 3,500 different components that every singles of these components need to go through strength test to ensure the safety. It took 6 weeks for the final installation by eight technicians from aerospace and motorsport, with assistant from four more technicians from Royal Electrical and Mechanical Engineers. 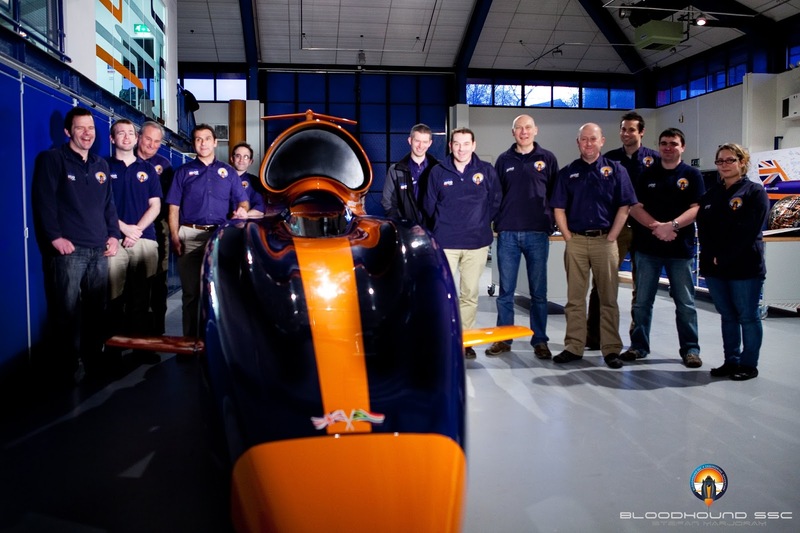 As mentioned earlier the Bloodhound project was designed to inspiring the new generations to be interested in science, technology, engineering and mathematics fields or also known as (STEM). Many programs designed together for all ages that include schools around UK and South Africa. 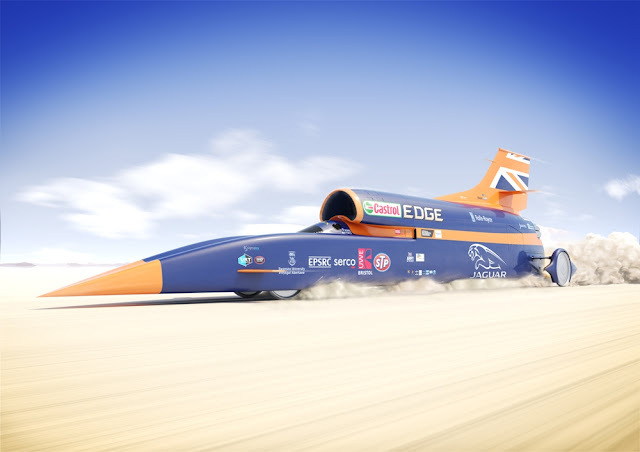 To know more about the Bloodhound SSC project you can visit to their website to see the last preparation before they’re ready for the final test. You can also participate in some programs or get yourself Bloodhound SSC merchandise.